Do you need carpet cleaning in Farringdon? 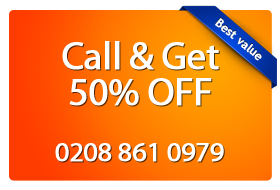 Magic Carpet Cleaning is London based company, with over 7 years experience. Our cleaners are using the latest cleaning equipment along with eco-friendly and child safe detergents. They are fully insured and certified. Don’t hesitate to call us now on 0208 861 0979 and our friendly customer support assistants will provide you additional information and a price quote. The citizens of Farringdon EC1 can get the benefits of Magic London Carpet Cleaning high quality services. Our cleaners are equipped with all the necessary tools to tackle any cleaning job, no matter the size or the fabrics of your carpets. They are using the most recommended methods by the industry – steam and dry cleaning. Deep steam cleaning is the most effective cleaning method today. It kills 99% of the germs and microbes and removes all the dust and the dirt. That makes it preferable for people with lung diseases and children. Dry carpet cleaning is much faster but less effective carpet cleaning method. It used in commercial properties, where long drying time are unacceptable. It prevents mold and you can use your carpets, right after the service. The prices are nominal considering availing Magic Carpet Cleaning in Farringdon (EC1) to work on the dirty carpets has its perks. They not only clean it to customer satisfaction but also provide valuable advice so that next time all spills and pet stains can be dealt with ease by the customers themselves. Specialized vacuum techniques set Magic London Carpet Cleaning apart from other companies in carpet cleaning industries. You can find us on 0208 861 0979, 24 hours a day. Our friendly customer support assistants are ready to help you, with all questions you have. Don’t wait to call us and you will receive estimate quote at no extra cost. Or you can simply fill the booking form and we will get in touch with you in no time.